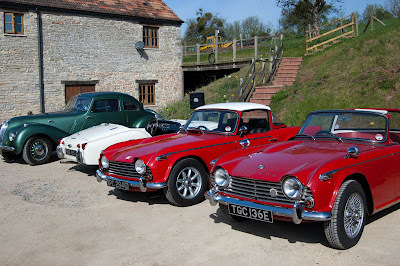 Comment overheard last year ,"There are more TR5's here than at Malvern"
RevingtonTR Open Day Saturday 6th April 2013. As most of our customers know, we specialise in Triumph TR's and our Open Day will lean heavily in that direction. But we also have products that suit all marques and some racing types as well. This will be where you can find out more detail about Evans Waterless Coolant, why Superpro polyurethane bushes are class leaders and lots more, all in a single day. We have therefore opened our arms even wider to include Local Classic Clubs and Local Motorsport Clubs. With a presentation by Graham Robson on the Triumph works cars supported by the works cars 6VC and 3VC, that by itself is good day out. If we can get even more cars from the local clubs that will appeal to a wider audience then it will be a brilliant day. Why not get your club to have a drive to Somerset and join in the fun. Spread the word - We hope you can make it. See www.revingtontr.com for more detail.